Th-INK-ing of You: Help for Katie Thank You... Sassy Cheryl and some awards! Help for Katie Thank You... Sassy Cheryl and some awards! Today I am sharing a card I made with one of the images you receive when you donate to the "Help for Katie" fund headed up by Jak Heath. Katie is a fellow stamper with three young children who has been diagnosed with stage 4 stomach cancer and the stamping community has come together to raise funds to help her and her family during this time. There were tons of images donated by wonderful companies and a great package was given out to anyone who donated. Now, Jak is holding a "thank you" challenge, and we are all invited to share a card we made with one of the images. I chose this cute little guy from Sassy Cheryl. I colored him with Copics. My sentiment is from My Sentiments Exactly. The sketch I used was from CDASC17, but unfortunately I didn't use the freebie image you had to use to enter this challenge, so .... I won't link it. My base is SU! Marina Mist and my designer paper is BasicGrey Marjolaine. I added 3 brads from my stash. I kept this one simple... I need birthday and get well cards for the Church, so this was made for that. Catered Crop - Recipe challenge: I chose Pattern paper with repeating patterns, Copic Markers with Black ink and Brads for embellishments. Samuel Taylor's Challenge - use Copic or Promarkers - a monthly challenge where anything goes as long as you use these markers. Now on to another subject.... Beautiful Blog Awards from sweet friends! 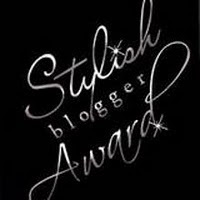 Right-click on the award and save it to your computer to add to your blog. 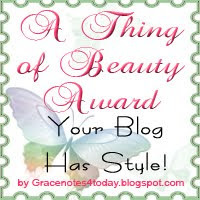 I was also honored to have been given this lovely Stylish blogger award by Lori and Sherry. Both these ladies are truly remarkable women who love the Lord and do beautiful work in their craft as well! Please take a minute to stop by their blogs and see their beautiful creations! For this award, I am to list 8 things you probably don't know about me and pass this on to 8 other lovely ladies. I realize that not everyone is comfortable posting personal information on their blogs and understand if those I pass this on to choose not to list something we might not know about them, but I hope they will know that I sent this because I enjoy their blogs because they inspire me with all the great work they do. So... I'm going to pull a no no here and combine these awards.... because I don't know if I can come up with 13 "new" things about myself to share, so by sharing the 8... I hope that will be sufficient! LOL! 1. I am a graduate of LeTourneau University in Longview, TX. My hubby and I both went there as married students right after we got married in the summer of 1971! 2. So if you are good at math... #1 gave you the hint, but I am coming up on my 40th anniversary!!! Yikes!!! 3. I have lived in 9 different states and my hubby and I have moved 18 times in our 40 years of marriage! 4. I am the survivor of an extremely bad hit and run accident that left me with a broken back, shattered spleen and several other injuries. I actually almost died but God apparently wasn't done with me yet, and He answered the prayers of people all over this country, from coast to coast I was covered in prayer! I have much to be thankful for! 5. The accident did trigger a chronic pain syndrome and I have Fibromyalgia. I am not complaining though! God has blessed me in many ways and even this is something that He has used in many ways! 6. I am actually very shy, though through my various jobs I have had to learn to be an extrovert.... so I guess you'd call me a "learned extrovert".... but still shy on the inside! 8. My hubby and I love to take weekend drives to little towns and rural areas... we enjoy the mountains in the fall, and the coast in the spring. We love stopping in quaint little towns, visiting their shops, viewing God's glorious creation in all the beautiful scenery we see, and of course... we love finding great little coffee shops! Yes... I am a coffee-aholic! Now I need to pass these awards on, and again I am combining them, so those mentioned can choose which award they want! I am always inspired by these blogs, and I hope they will each accept this award in the spirit it is given.... to let them know how much I admire them and their work. Sabrina - SJButterfly Dreams Sabrina is a DT sister whom I have come to love dearly. She is the most supportive person! She is always faithful to leave encouraging comments on everyone's blogs, and she does the most beautiful work on her own! She loves the Lord and lets her light shine everywhere she goes! Chris - Twinkles Glow with Stamps I know Chris is very busy and might not have time to post her award but I want her to know she's on my list of most treasured people and her blog is an amazing thing to see! She is on many DTs, including two with me, and we have become real life friends as well as DT sisters. She lives near to my DMIL and so when we go "home" we meet eachother. We talk on the phone all the time and I treasure her more than words can say! Nina - Crafting in Croatia. Nina also is a very busy and talented lady who might not be able to post her award, but I am truly inspired by Nina in so many ways! I have become a fan of her stamp designs and have bought several, and I love her classic style of cards! I love her Christian testimony and how she never misses a chance to tell of her love for her Savior. Diane Noble - Diane's Designs. Diane and I first met when I just started blogging and she invited me to write devotional thoughts for Women to Women. I fell in love with her heart, and boy does she have talent too! She shares lots of tips and how tos on her blog and is a joy to know! MariLynn - Mississippi McGyver MariLynn is a sweet paper crafter I first met on SCS. She always creates the neatest designs and is extremely creative.... and she loves the Lord with all her heart as well! I was so glad to see her start a blog as well! Christine - ChristineCreations I first met Christine on SCS, and was in awe of her talent. Then we were DT sisters on Our Daily Bread designs together for a while. Christine is an extremely talented artist! She blows me away with her creations! I know she also is very busy with her DTs and her youth ministry, and might not be able to post this award, but when it comes to people who inspire me, she is high on the list! Betty - Stamping to the Wright I first met Betty on SCS and again was in awe of her talent. I was a DT sister with her on ODBD too, and happily, she still is present with us there as she hosts the Stamping in Time Challenge every other Thursday. Betty has a unique style that I just love! She is fun too! She lives on the other end of NC and one of these days, I'd love to meet her in person! Melisa - Paperlicious Designs I met Melisa when she came on to the Layers of Color DT. She is such an organized person and so encouraging! She has sent me several gorgeous cards in the short time I have known her and I just love her style, her wit, and her support! I realize many of you are too busy to post these awards, but they come from my heart to you personally, and I fully understand if you can't post them.... just enjoy what they represent! Oh grace! What an excisete card!!! Love the colors!Love the image!!! Cute card! I like the patterned paper! Thanks for sharing! :) Blessings! I love your sweet card, Grace, and I loved getting to know you better! Great design with all the patterned papers! Thanks for joining us for Timeless Tuesday! Grace this is so SWEET! Beautiful card; I like the framing / matting and the happy colors!! 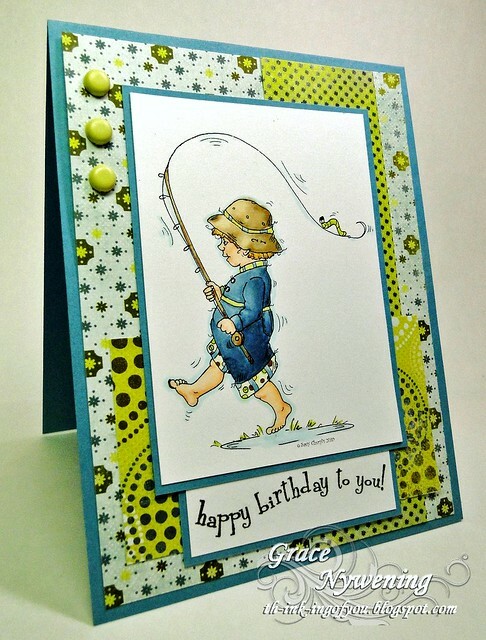 Hi Grace...love this card, it's sooo cute :) And those Marjolaine papers are gorgeous! Thanks for joining us at The Outlawz Copic challenge this week. AWW Grace this is sooo super SWEET, LOVE this image, your coloring and the bg dp is FABULOUS!!! Another fabulous creation sweetie!! hugs! You are too sweet. Thanks for passing the awards along to me. It will be a delight to post them on my blog and pass the love around. I'm still at Jeff and Jori's helping them unpack, but I'll do it when I get back home. Thank you so much for your sweet words, Grace. Did make me a little (a lot) homesick for WTW though. So glad we are still connected. Thank you so much. Fantastic artwork here, by the way...as always. Love your style. Grace, what a beautiful card, the coloring is outstanding. That little fella is so cute, love those toes. Grace, you are an amazing friend with so much talent. I just love your card!! The image is darling and your design is beautiful!!! Gorgeous coloring!! Your words brought tears to my eyes. I just love you more than words can say. Your love for the Lord and others is written all over these wonderful words you shared about each and every person. Thanks for being such a treasured friend. I am honored to receive this award. What a cutie your little fisherman is, and so sweet for Katie. Thanks for playing along with Catered Crop. What a cute card made by such a beautiful person. If I had a blog, I would be so honored to receive such a reward. God Bless! WOW! A blog award for me! And, with such a wonderful comment! YOU are the inspiration, Grace! Blessings to you and yours my friend! Your card is too cute and fabulously colored! Adorable! Thanks so much for playing Flourishes FTTC "3 patterns" Challenge! What a cute card Grace, adorable image. Your fisherman is so CUTE, love your colouring and the lovely colours you worked with! Hello Grace ~ I love your cards...and even saved the awards for myself...until I got to the end and found that I was not listed...LOL....I have to laugh at myself on this one...Your work is extraordinary...and you are gifted beyond with God's Grace...Thank you for sharing and for letting me get to know you better! This is adorable.. I love your coloring Grace.. Terrific job on this beautiful card...See you soon. Hello my sweet friend! Thank you so much for my blog award! I enjoyed reading more about you in your list and I hope we get to work together again on a design team in the future. You are so very talented and I just love your elegant style Grace. Thank you so much for all of YOUR support over the last couple of months! This is so adorable!! Thanks for cooking it up with the Catered Crop recipe! Darling card. The image is so charming and you did a wonderful job coloring it. Thanks for sharing it for the AnnaBelle Say it with Polka Dots challenge. Darling card. The image is so sweet and colored so beautifully. Thanks for joining us for the AB Say it with Polka Dots challenge. What a wonderful card! Your patterns and colors are just perfect with this little fella. Thank you so much for joining in on our "boy" challenge this week at Claudia and Company! Precious...love the sweet image!! Thank you so much for playing along with us at Claudia & Co this week!! Beautiful and very fun card!! Thank you for joining us for the Bold & Bright challenge at Simply Create. Hope so see you again for the next challenge.